Job candidates with tech skills in general and Linux skills in particular tend to face better-than-average prospects in today's otherwise gloomy hiring marketplace, but in the past few days the outlook appears to have gotten even brighter. Following hard on the heels of news from a few weeks ago that DevOps is a growing trend, three separate reports in recent days suggest a particularly rosy future for those with skills in Android, Linux, and open source software. “Top Five Tech Jobs Point to Opportunity for Linux Pro's” was the Friday headline at Linux.com, for example, in which author Jennifer Cloer reports on staffing and consulting firm Robert Half International's new Salary Guide listing the top five most lucrative tech jobs for 2013. Mobile app developers, wireless network engineers, network engineers, data modelers, and portal administrators are the most promising jobs for salaries next year, the publication predicts, and “the most important thing they have in common is that they each require a fundamental understanding of Linux,” Cloer notes. Also on Friday there was the headline, “Open source hobbyists now in high demand” over at ITworld, in which author Brian Proffitt mulls open source operating system Contiki. Then, on Monday came a report from IT careers site Dice naming several key skills being sought at all-time, record-high levels. 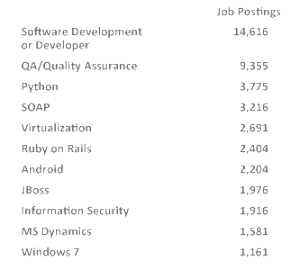 Software development and quality assurance lead the list, but among those next in line are Python, Ruby on Rails, Android, and JBoss. As for Linux-based Android, job postings seeking skills in that area are up a full 33 percent over last year, Dice reports.